Richard Nichol – Putting the snow behind? Weather what weather !! 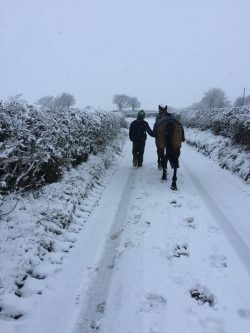 If you have horses you deal with it and carry on! Frozen water buckets,defrosting pipes , clearing walk ways ,extra rugs thermal underwear , thicker gloves and woolly hats! I just can’t wait for Spring. However up until the weather changed at the end of February my yard full of horses were all in fine form with Samson’s Hill and Avalon V showing exactly what there made of and clicking up 10 double clears between them in under a month of being registered, which gains them qualification for the regionals later in the year! Cadillac is still at the top of the winter Dressage League at Greenlands Equestrian and Arland H is leading the winter showjumping points at Blackdyke so as we press on in to my birthday month of March it looks set to be another action packed competition time ! Hoping to leave the snow behind!